A sensitive internal document from the Drug Enforcement Agency reveals that messages sent through Apple’s iMessage chat service presented a difficult challenge for federal drug enforcement agents who attempted to eavesdrop on such messages. The said document, seen by CNET, reveals a February 2013 crime investigation scenario wherein agents were warned in a memo that messages sent via the iMessage chat service are not captured by pen register, trap and trace devices, or Title III interceptions. According to CNET, FBI Director Robert Mueller refers to this difficulty with intercepting messages sent via iMessage as the “going dark” problem, where police fails to conduct even cout authorized surveillance on non-traditional methods of communication. iMessage was first announced in mid 2011, and has since then gone on to become the most popular chat program available, characterized with secure end to end encryption. 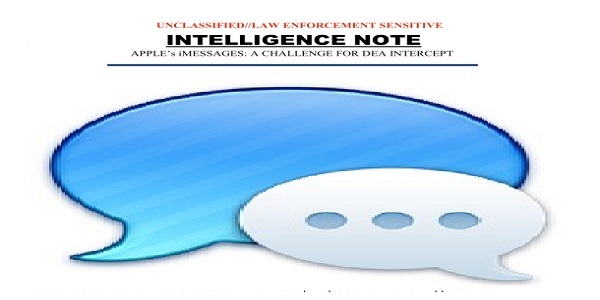 The intelligence note was prepared when the DEA San Jose Resident Office learned on February 21, 2013 that iMessage conversations between two Apple devices can’t be intercepted regardless of the device user’s carrier. The note goes on to warn investigators that they might erroneously believe to have a complete record of text conversations intended to be intercepted if they are not aware that cellphone service providers do not capture iMessage communications between smartphones. iMessage conversations between an Apple and a non-Apple device, the note says, can sometimes be intercepted since these are sent as SMS. In this case, the result is successful if the intercept is placed on the non-Apple device, the note stipulates. The issue of law enforcers facing difficult challenges in intercepting communications in illegal activities, however, is nothing new. In May last year, the government asked the support of web companies by not opposing a law that would require providers of VoIP, instant messaging, and email to render their codes to become wiretap-friendly. The shift to internet communications, law enforcers noted, have made it difficult to put Americans suspected of illegal activities under surveillance. Currently, telecommunications service providers are required by the Communications Assistance for Law Enforcement Act (also known as CALEA) to give leeway for easy surveillance; but this requirement does not apply to internet companies, which are only required to extend technical assistance.